You go in for an interview, and after a harrowing two hours, walk out feeling relatively confident that you made a good impression. Your resume was flawless. Your cover letter was witty and showed passion. Your interview outfit was on point. You thought you really bonded with the team that interviewed you. Nothing could go wrong, right? What went wrong? You forgot a vital (and oft-overlooked) part of the job search process: the interview thank-you email! 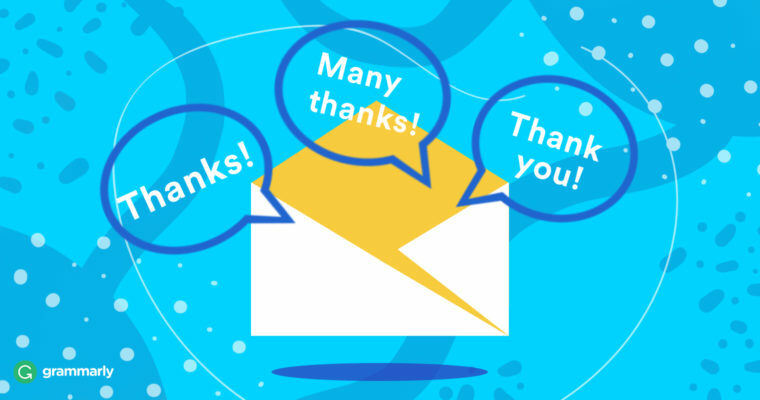 Why Should You Send a Thank You Email or Letter After an Interview? If you think it’s terrifying being interviewed, you’re not alone. But let me tell you, interviews (especially in-person interviews) can be an equally traumatizing experience from the other side of the table. I kicked off the search for my first hire at Bloggr earlier this year, and when the first on-site interview came around, I was terrified. Sitting there with my list of questions and my notebook, I tried to simultaneously project confidence, follow my company’s values, ask the right questions, make sure my hair didn’t do anything weird, and (attempt to) mask my nerves. Even if interviews are a vital part of the recruiting process, the first round of the interview process can be awkward for everyone. That’s why it’s key to write a thank you note after the interview—often the process has made them just as uncomfortable as you are! That’s why a killer post-interview thank-you note can help you make a great impression and land the job. Think of it this way: Your interview isn’t over until you send a thank you note. You want to move the hiring managers from interview mindset to decision mindset as quickly as possible, so don’t drag it out. I really like thoughtful, sincere thank you notes after interviews, and I always sent them when I was interviewing. It doesn’t have to be formal, just a nice note to express interest and thank someone for their time. Additionally, a great thank-you note can make you stand out from the crowd. CareerBuilder determined that send thank-you notes, and would be less likely to hire someone without a thank you. That could mean the difference between a job and a rejection. With any important piece of writing, planning is half the battle. Should you follow up over email, in a handwritten notecard, or on social media? And what should you write? Write from the heart! If a candidate is going to write a standardized, impersonal note, there is no reason to even send it. How did the interview go? Did anything weird happen? Did I flub on a question I know I have a better answer for? Did I forget to ask the interviewer one of my questions? Is there something additional this interviewer should know about me? Did I discuss anything interesting? Find any similarities to my interviewer? Who are you trying to thank? The interviewer (this is who you should be trying to thank, directly) or the entire corporation and all of its thousands of followers? Seriously. By now, you should have a format, deadline, and list of ideas for your thank-you note, and it’s time to slap on your writing hat and get to work. Here are the general principles of a great letter or email. Be your best self, on paper. Your cover letter and resume were all about representing the best version of your professional self, and this thank-you note should be no different. Don’t resort to overly familiar language just because you’ve met someone in person, but also don’t suddenly become cold and dispassionate. Keep the same tone you would in any other email to the recruiter or hiring manager, and if there’s a place to remind them of your passion for the role, go for it! The only thing you should avoid in a thank-you is trying to sell yourself once again. You’re writing this note to show you appreciate someone’s time, not to tell them you’re awesome. Remember that. Keep it short, and mind your structure. In the same vein, don’t suddenly write a novel about how much you love the company or the person you talked to. You may have many things to tell this recruiter or hiring manager, but try to stick to one main point, question, or fun fact. Personally, if I’m reading a thank-you email longer than five sentences, I’ve probably started to wonder if the time to read it was worth my investment. Knowing how to write a thank you email after an interview is a valuable skill. Trust me. I know all of this sounds great in theory, but slamming pen to paper (or fingers to keys) to write a thank you letter after a job interview is a very different matter. Never fear, templates and suggestions are here! Before I share a general format, I want you to repeat after me: “I solemnly swear not to copy-paste this template into my email.” We’ve already covered why a generic thank you is almost worse than no thank you, but in case you’re not convinced, That said, so feel free to steal any of the phrases or sentences below and make them your own! Here’s a great sample thank you email after an interview. Thanks for Chatting Today – Use something like this if you had a phone screen or video interview. Nice to Meet You Today – This works well for interviews that take place on site. Thanks, and a Question – Have a nagging, relevant question that shows you’re passionate about the role? Use this email to follow up after your interview! Thank You for Your Time – Especially good if it was a long interview. Many Thanks – Short, sweet, and classic. It was really nice meet you today. Thanks for taking the time to introduce me to the team today. Thanks for chatting with me today. Thank you again for your time, and let me know if there is any further information I can provide to aid in your decision. Let me know if there is any more information I can provide. I’d be happy to follow up on any items we discussed today. Thanks again for your time. It was great to meet you! Thanks again for chatting with me. I am eagerly awaiting next steps. I love to edit all sorts of writing, but I know this isn’t true for everyone! Since editing can be a time-consuming step, here are two checklists you can use to make sure your email is flawless: one for real letters and one for emails. Don’t worry, editing shouldn’t take longer than five minutes, so you’ll still get that email out in time! Did I format this note correctly? If it’s handwritten, can any average person read my handwriting? Have I addressed the person I’m thanking correctly? Am I spelling their name right? Did I make my point in under five sentences? Did I mention a specific topic, common interest, or question relevant to my discussion with this person? Did I say “thank you” at some point in the note? Did I sign the thank-you letter? No really, is the writing flawless? Have I addressed the envelope, purchased postage, and mailed the letter within 24-48 hours of the interview? If you did all of these things, congratulations! You deserve to put your feet up and sip your favorite post-interview beverage (mine’s herbal tea, but you do you). Did I include a relevant subject line? Is everything spelled correctly there? Have I addressed the person I’m thanking correctly? Am I spelling their name and email right? Are my signature, email name, and email avatar photo all in alignment to project a professional image? Did I hit “Send” within 24-48 hours? If you did all of these things, congratulations! You deserve to grab a book and a snack and take a break. The hard part is (mostly) over. Need more help following up after interviews? Check back for more insights next week.